March Madness is narrowing down the field and cranking up the excitement. By the end of the weekend, the elite 8 will be reduced to the final four. I did not do a bracket this year – I’m not a huge basketball fan. But in my many years as a casual fan of NCAA basketball, I’ve learned one thing. The chances that Duke will be playing in the final 4 or at least the sweet 16 is almost a given. 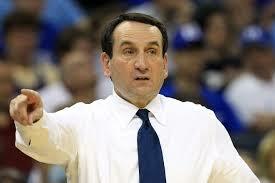 The key to their success can be attributed to the amazing job done by Coach Mike Krzyzewski. 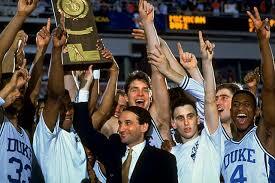 11 final four appearances including a string of 5 in a row and 7 in 9 years). Add to that college resume his success in international competition (defending 2 time Gold Medal champ – 2 more Olympic Gold medals as an assistant coach. 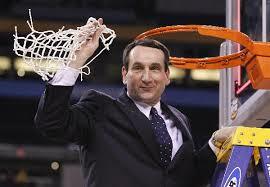 And it is obvious that Krzyzewski is a great basketball mind. Be a good guy – Seems simple and basic, but sports is a competitive world, and when competition and seeking to be the tops often some things that can be compromised are nice guy-ness and good sportsmanship, I know that when I played church league softball in high school and university, I had a terrible attitude when it came to failing and losing. If I got out, or if we were losing, I was not a nice guy, I was a poor sport, I would throw stuff, slam my glove, yell at myself and spiral worse downward. It was not a good reflection of who I wanted to be and it was not a good reflection of who God calls us to be. Being competitive in itself is not a bad thing, but we still need to reflect Christ in our words and actions. Setting meanness and anger aside and choosing kindness, empathy and morality is a Christ-like way to carry ourselves and in our desire to reflect Him in all we do, it is how we should choose to live.